Well look at the time. It's my birthday! I'm turning Old. Lots of big things happening, besides the anniversary of my eviction from a placenta! 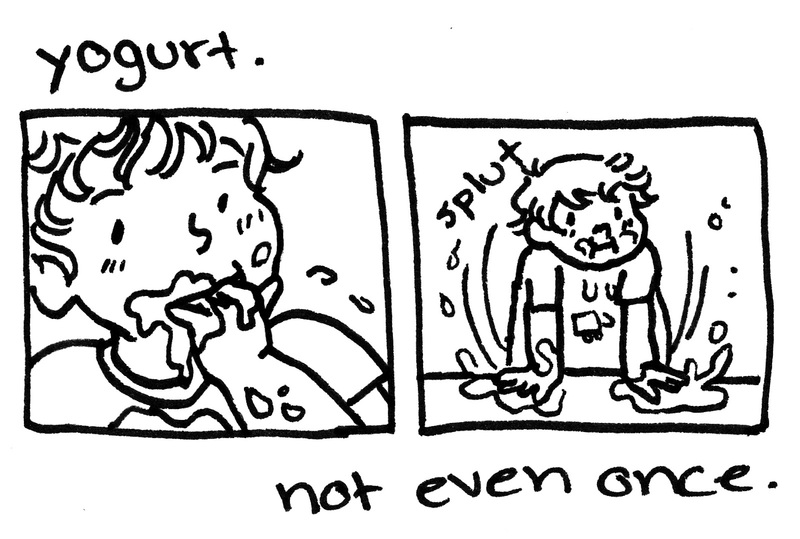 Today I am going to send my senior thesis book to be printed (gasp!) and this weekend I'll get to bind it. Next week is when all of my finals are due (well, except for a lone presentation on the 9th although the project is technically due on the 2nd..). The following week is the big Senior Thesis Show, which is crazy exciting. And then what? Then I'm DONE. I'll be officially a college graduate! A few days after the senior show, my best friend is coming in to town, then my grandma, then we're having a party for my sister (she is also graduating) and me.... like I said, there is a lot happening! 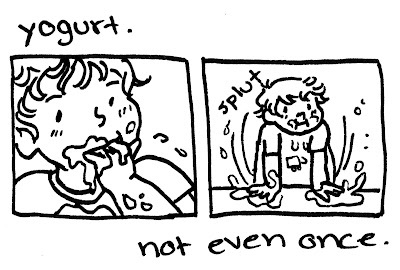 So here's a comic I scribbled after babysitting a group of kids who really wanted their yogurt.